Drink Company’s floral wonderland returns on Feb. 28 with some wild new additions. Cherry Blossom PUB’s “Honeydew, Honey See” cocktail. Photo by Nicholas Karlin. Drink Company’s Cherry Blossom Pop-Up Bar will return for its third year on February 28 with even more faux-flowers and a new lineup of Japanese-inspired cocktails. In past years, the Shaw bar has also featured nods to Japanese pop culture, including Super Mario Bros. decor and a 10-foot tall animatronic Godzilla. This this around? There’s an entire room designed to look like you’ve stepped into a giant bowl of ramen. Bonus: you can actually eat ramen there. When guests initially walk in, they’ll be immersed in a blossoming fairytale garden. The bar’s special projects team, Matt Fox and Adriana Salame-Aspiazu, drew inspiration from a Chanel fashion show (depicted in the Netflix show 7 Days Out) that drew inspiration from a lattice-covered courtyard at Versailles. More than 100,000 cherry blossoms will canopy two bars, transitioning from pale pink buds to peak bloom. Artist Andrew Funk has painted dramatic modernist landscapes to make patrons feel like they’re standing in the Tidal Basin. There’s also a photo booth, because, of course. The back of one of the bars will be devoted to the Alice in Wonderland-style oversized ramen room. Foam pool noodles will burst from the wall while eight-foot long chopsticks will be suspended from the ceiling. Large installations of ramen toppings, like fish cakes, pork belly, and scallions will surround the room. Chef Hiro Mitsui, who runs the Uzu ramen stall in Union Market, will sell his ramen on-site every Wednesday through Sunday. He’ll offer a vegan miso ramen starting at $13 with optional add-ons such as egg, kimchi, or pork belly. The “Once and Floral” cocktail with gin, peach, matcha, lemon, orange flower water, and egg white. Photo by Nicholas Karlin. Head of Bar Concepts Paul Taylor will also incorporate Japanese ingredients and flavors into the cocktails ($11-$14). “Once and Floral” builds off a gin sour with the addition of peach liqueur, orange flower water, and matcha. 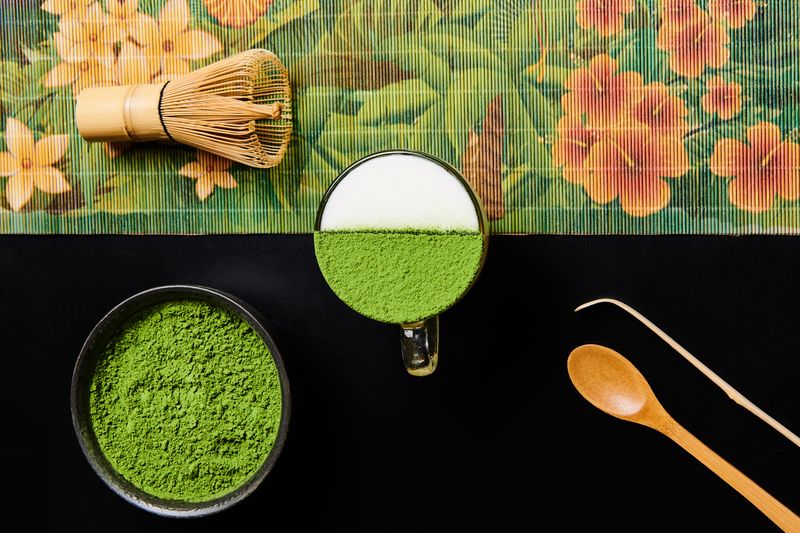 It’s served in a tea cup with green tea powder sprinkled on top. An apple-centric drink dubbed the “Nyango Star Sour”—named after a cat crossed with an apple that plays heavy metal drums—brings together apple, pear, and grape brandies with varying levels of acidity to create a complex apple-like taste. Of course, the bar will bring back its novelty glassware as well. A twist on a pina colada that subs in Calpico (a sweet yogurt drink) for pineapple comes in a maneki neko lucky cat glass. A cherry blossom gin and tonic is served in a koi fish vessel. The Cherry Blossom PUB will run through April 21—but there’s more to come. The third bar in the pop-up space remains a mystery for now and will open sometime in March. “It’s something different, but there will be some parallels between them,” Taylor says. Cherry Blossom PUB. 1839 7th St., NW. Feb. 28 through April 21. Open daily at 5 PM until 12:30 AM Sunday through Thursday and 1:30 AM on Friday and Saturday.